Want to make the most of your Iceland adventure? 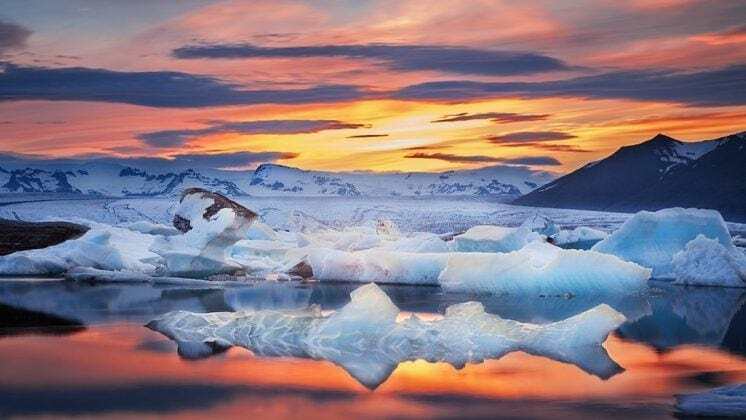 Our Jökulsárlón Glacier Lagoon Tour is one of the best day trips from Reykjavík to experience the majesty of Iceland in one epic full-day tour. 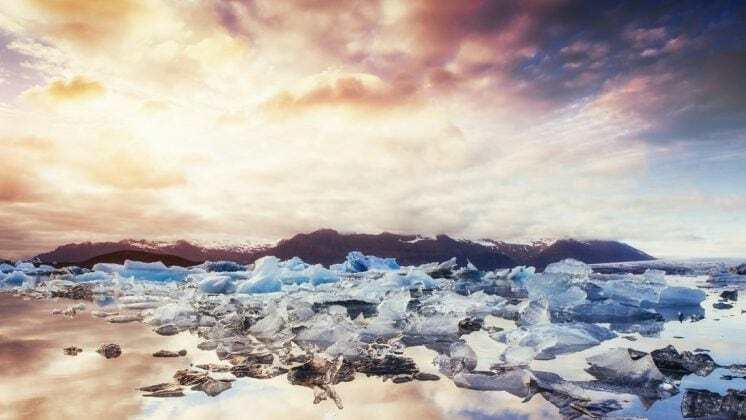 Feel the awesome force of nature at the Jökulsárlón Glacier Lagoon as you witness glacial icebergs floating out to the ocean. You may even get the chance to float with them – more on this soon! Book now to secure your own icy adventure, or keep reading for the details. 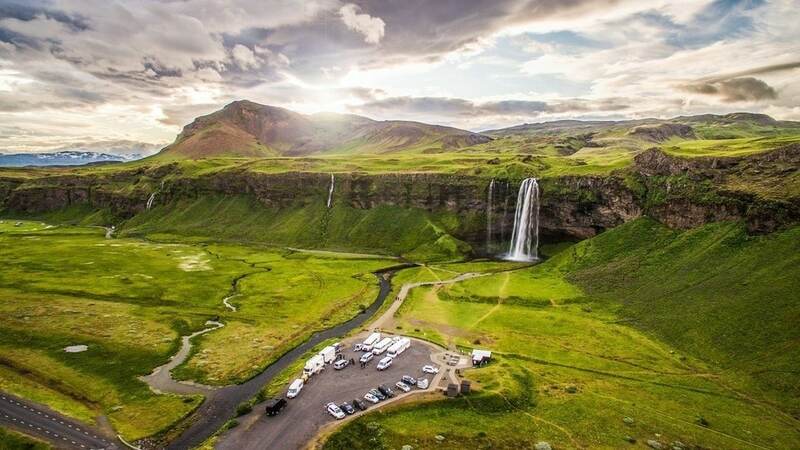 You’ll experience some of Iceland’s most stunning sights in one action-packed day – all without needing to plan a thing! Simply use our easy online bus booking system, and we’ll pick you up in the morning and take care of all the arrangements for the day. So, what will you see? 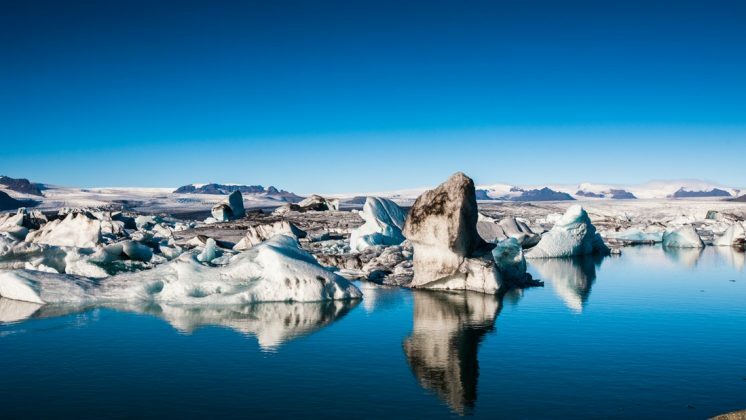 On your Jökulsárlón day tour, you’ll experience the epic beauty of the famous Jökulsárlón Glacier Lagoon. The floating chunks of ice create a unique and fascinating landscape (more detail on this to come). Nearby is Diamond Beach, with its dramatic contrast between the white icebergs and black sand. 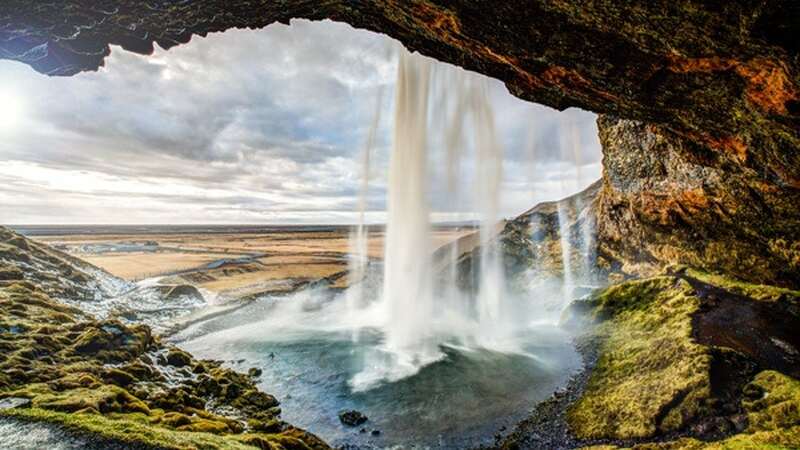 Next, you’ll also visit the magnificent Seljalandsfoss Waterfall. You’ll have the chance to get up close and personal with the falls – check out the tips below to make sure you don’t get too wet! Later in the day, we’ll make a stop at the charming Icelandic fishing village of Vík to catch a glimpse of local life and perhaps pick up some handmade gifts. Plus, Jökulsárlón Glacier Lagoon Tour may even include a bonus secret stop! For your comfort: Dress to be prepared for the weather! In Iceland it’s always wise to wear/bring warm, waterproof clothes, as weather can change quickly. (The waterproof aspect will be especially important at the Seljalandsfoss Falls!) We recommend a waterproof jacket and pants, hat and gloves, warm socks and waterproof shoes. My daughter and I thoroughly enjoyed our tour. Our guide Matt and driver Lucasz made a great team and worked together to maximize the short December daylight hours. We made several short bonus stops in additional to seeing everything promised on the tour. Plenty of stops for restrooms and food too. The bus was comfortable and had a bathroom. The highlight for us was Diamond Beach - incredibly beautiful! Thanks to Matt’s stories and fun facts the long drive flew by. A long but wonderful day. The trip was along spectacular scenery with waterfalls and unique landscapes. The tour was managed well, with regular stops for restroom breaks. The glacier lagoon boat ride was very nice. Above all, Howser was an excellent and fun guide and Thomas a good, safe driver. Well done guys. 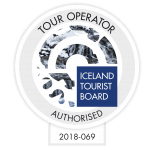 I loved the tour to the glacier lagoon, with great stops along the way - 2 waterfalls, view of a glacier, plenty of time at the glacier lagoon and "diamond" beach, and Vik, with stops for meals and bathrooms as well. We left on time and got back around 10pm. It was a long day but worth it for all the sights, stunning scenery, and beautiful photos I got. The bus was very comfortable and easy to nap in as well. I especially enjoyed the guide's stories and explanations of icelandic culture and history. Detailed Itinerary – Multiple Attractions, One Epic Day! 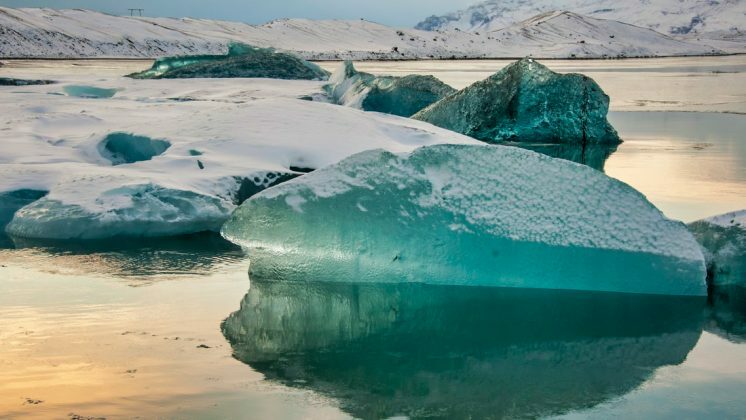 Your Jökulsárlón tour from Reykjavík will begin with a fuss-free pickup from selected hotels or designated tour bus stops in downtown Reykjavík. Along the route from Reykjavík to Jökulsárlón iceberg lagoon, you’ll witness the majestic scenery of the south coast of Iceland. The dramatic landscapes of Iceland will pass before your eyes, from mountains and glaciers to ancient lava fields. We’ll take a scenic stop along the way to enjoy the views while you get some fresh air and have some lunch at a local restaurant. Now for the main attraction! The stunning Glacier Lagoon is one of Iceland’s most popular attractions. As you gaze across the turquoise glacial lagoon, you’ll spot pieces of ice floating across the water. These break off from the Breiðamerkurjökull glacier – an outlet of the Vatnajökull glacier, which is the largest glacier in Europe. The Jökulsárlón iceberg lagoon is also the deepest glacial lake in Iceland at 250 meters deep. Once they break away from the huge glacier, the chunks of white-turquoise ice slowly float out to sea. As you explore the serene blue ice lagoon, you’ll truly get a sense of the vast and ever-changing power of nature. It’s no surprise that this unique and constantly shifting landscape is so popular with travelers and photographers. The Jökulsárlón glacier bay is a stunning place to take some amazing photos of your own, too! 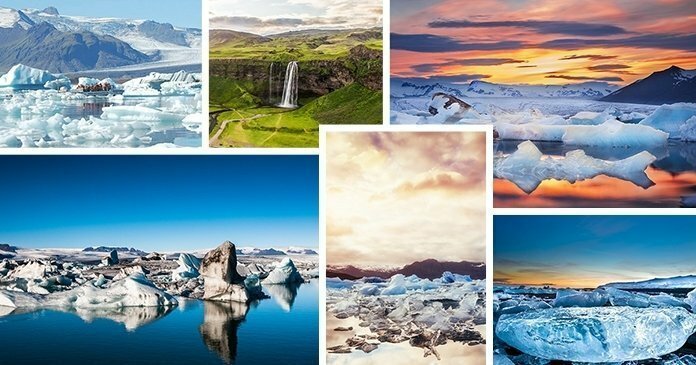 The Glacier Lagoon is now officially part of Vatnajökull National Park, whose territory includes other amazing landscapes like the Vatnajökull ice cap. In 2018, the park was nominated for inclusion in the UNESCO World Heritage List. During the summer months, you’ll have the option to get out on the water and take a boat ride right into the heart of the icy lagoon. The boat ride will last about 30 minutes. You can book your Jökulsárlón boat tour add-on ahead of time along with your main tour to guarantee a place (provided it’s the season when the boat trip is running). 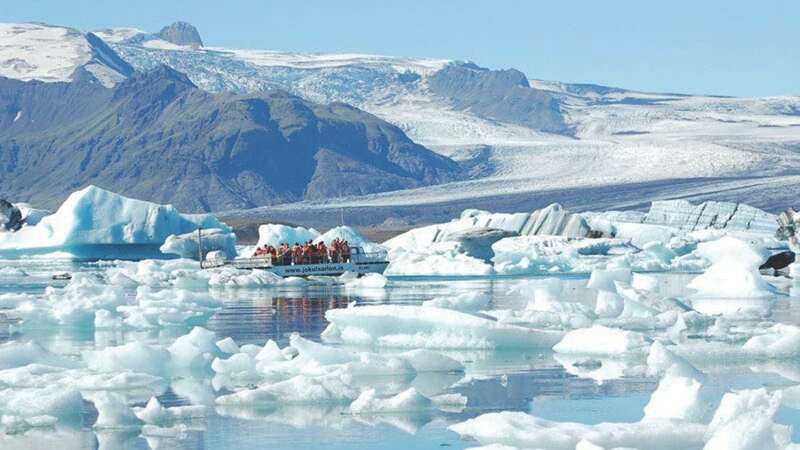 Alternatively, you can purchase the Jökulsárlón lagoon boat tour add-on directly on the bus (subject to availability on the day). As part of our stop at Glacier Lagoon, you can take a short walk to nearby Diamond Beach. Explore the blue-white icebergs that wash up on this black sand beach. Iceland offers some stunning natural contrasts, and this glacier beach is a great example. Next up, we’ll stop at the small fishing village of Vík – the southernmost village in Iceland. With a population of just 300 or so, this little village offers some great options for dinner at local restaurants. Seljalandsfoss is one of the most famous waterfalls in Iceland. This 66-meter cascade is impressive from the outside – but that’s not even the most impressive thing about it. It’s a waterfall that you can walk behind! Iceland has some amazing waterfalls, but this aspect is quite unusual. You’ll experience the power of the rushing falls from a unique perspective – behind the waterfall (conditions permitting – in winter the path behind is often closed due to dangerous conditions). Of course, you might get quite wet in the process! We highly recommend waterproof shoes and a waterproof coat to protect you (at least partly) from getting soaked. Be sure to note the pickup time on your ticket. Pickup may take up to 30 minutes starting from the time stated on your ticket. You can request a pickup from selected hotels or from one of the designated Tour Bus stops throughout central Reykjavík. Food is not included on the Jökulsárlón day tour, but there will be plenty of opportunities to buy food throughout the day. Put the “ice” in Iceland with our Jökulsárlón Glacier Lagoon Tour! 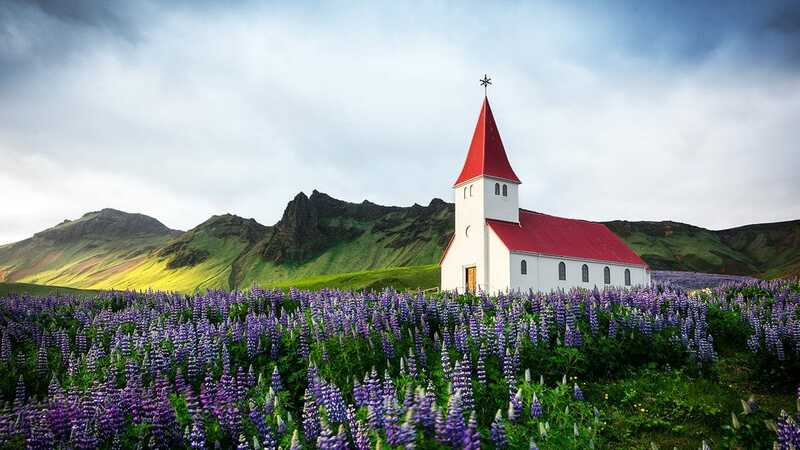 This Iceland south coast tour gives you the chance to witness some of Iceland’s most stunning and varied scenery in one convenient day trip. 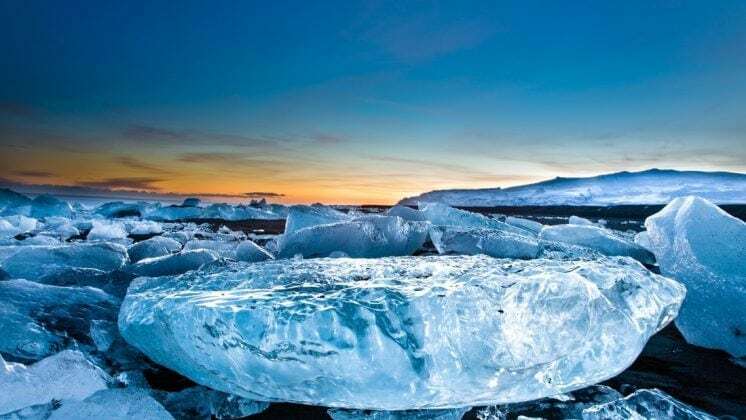 If you’re looking for a fun, action-packed, Jökulsárlón tour from Reykjavík, we’ve got you covered. Don’t miss out – reserve now for your ice lagoon adventure! Want to book this tour including the boat ride? Want to experience the magic of the Aurora Borealis? Our Northern Lights Tour will give you the best chance of seeing these enchanting lights!